We know it's a goldfish and not a red herring, but look at the effort we made. After a week's hiatus, 7DiG has returned with some good news (yay) and some bad news (boo) along with a chat with David Braben and some nice fried red herring. We know that words like administration and tax are not things you want to be dealing with on a Friday, so from this point on we'll be using the words Admo and TX! to make the whole thing more digestible. Game over man - Sad times people – UK retailer Game has gone into admo and slapped a pre-owned sticker on itself as it looks to keep going in some form. Tax relief - So imagine Pac-Man where the Ghosts are, like, TX! collectors and the UK games industry is Pac-Man and the fruit is erm George Osborne's TX! relief. That. Yay. 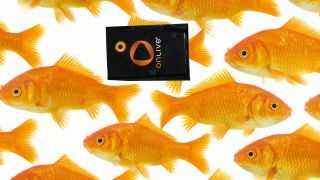 OnLively debate - "OnLive is a red herring which won't be around in five years," said GamesBrief's Nicholas Lovell in a debate this week about streaming games. For the love of God, get off the fence Nic. Final Frontier - At the same conference, 7DiG bumped into David Braben. Well, actually we bumped the people out of the way who were crowding round the gaming legend just so we could talk to him. Anyone who starts their speech with "I'm sorry I may have misjudged what I should be talking about" is in no danger of losing their legendary tag with us. Xbox Lite - So you know the Xbox 720? Well apparently Microsoft is more likely to roll out an Xbox Lite before it looks to the next next gen. Xbox 540 anyone? Xbox iPlayer - Even more exciting for you Xbox peeps is that the iPlayer for Xbox has arrived so you can finally watch television on your television! Woo? WoW - a new trailer. We were going to throw in a disappointing ending to 7DiG this week, but fortunately we've been watching the Mass Effect 3 saga closely and apparently it's up to you guys to decide how we end. We'll be bringing you the options via DLC next week. Skyrim's first DLC is Dawnguard?